1) Legal Sea Foods in Charles Square is entering the final month of their “Endless Summer” series in August, with monthly themed eats exclusive to its al fresco Terrace Bar situated in front of the Charles Hotel in Cambridge. The Terrace Bar kitchen will feature the Down East Boil – feeding two to four people – every day in August. For thirty one days and nights, Legals will serve up the bucket filled with chilled peel and eat shrimp, whole Jonah crabs, snow crab legs, marinated mussels and Narragansett beer. 2) Chef Brian Poe is bringing a taste of summer to Beacon Hill by rolling out an updated menu filled with seasonal specialties at The Tip Tap Room. In addition to serving up his signature protein and vegetarian tips as well as burgers, Chef Poe now is cooking up inventive new options with international flavors. To start, new appetizers include the Burrata with aged coppa, heirloom tomato, herb bread crumbs, arugula and chervil with a cherry pepper vinaigrette and toast points ($14.95); Rock Shrimp Tempura with sweet chili-garlic aioli, baby corn and asparagus tips ($16.95); Duxbury Clams with beer broth, chorizo, cherry tomato and toast points ($17.95); Hummus & Tabbouleh with crispy garlic, roasted red peppers, crumbled feta and grilled naan ($11.95); and, Fried Oysters with lemon powder, mango coulis and bacon tartar sauce ($15.95). The small plates also have been revamped with vegetable-forward options like Cucumber with cherry tomato, basil and candied lemon vinaigrette ($7.95); Zucchini that is buttermilk fried and served with Thai chile aioli, eggplant slaw and ricotta salata ($8.95); Corn with cotija cheese, ancho chili crema, lime and guajillo ($7.95); and, Risotto with Parmigiano-Reggiano, pea tendrils and freeze dried corn ($9.95). For soups, there is the Watermelon Gazpacho with jalapeño, avocado, cucumber and feta cream ($11.95) and Lobster Bisque with corn, potatoes and ginger ($13.95). Salads can come topped with a choice of tips, with newcomers such as the Baby Kale with peppadew peppers, carrot, crisp quinoa, egg, Idiazabal cheese, fried shallots and sherry mustard vinaigrette ($11.95) and Strawberry Salad with native mesclun greens, goat cheese, candied hazelnuts and mint vinaigrette ($12.95). 3) On September 24, music legends The Marshall Tucker Band will headline the 7th annual Hoedown fundraiser in Wayland. The fundraiser will benefit Lovelane Special Needs Horse Riding Program, a therapeutic horseback riding program serving children with disabilities in Lincoln. The highly anticipated event is the premiere fundraiser for the Lovelane program. Guests are encouraged to dust off their cowboy boots and dress casually for a night of music, dishes prepared by Boston’s finest chefs and dancing under an outdoor tent all to benefit the children with special needs who participate in Lovelane’s program. In addition to The Marshall Tucker Band, Hoedown will also include a live set from David Foster and the Mohegan Sun All-Stars, local Boston favorites French Lick, featuring Celtic’s owner, Wyc Grousbeck on drums and Jon Cohan & His Golden Rulers featuring blues performer Erica Rodney. Boston chefs and restaurants will be providing bites for the evening, including: Dave Becker of Sweet Basil, Tom Berry and Juan Pedrosa of Yvonne’s, Joe Cassinelli of Posto, Steve DiFillippo and Rodney Murillo of Davio’s, Carey Dobies and Israel Medina of Bokx 109, Scott Guitose of Blue Ribbon Barbecue, Andy Husbands of Smoke Shop, Phyllis Kaplowitz of Bakers’ Best Catering, Barbara Lynch of No9 Park, B&G ysters, The Butcher Shop, Stir, Sportello, Drink and Menton, Jeff Pond of Area Four, Keith Pooler of Bergamot, Dave Punch of Sycamore of Newton, Tatania Pairot Rosana of Outlook Kitchen and Bar, Joshua Smith of Moody’s Delicatessen and the Backroom and Jason Tom of Night Market. For beer and liquor connoisseurs, Deep Eddy will offer Vodka tastings. Clown Shoes, Farmer Willies Ginger Beer, Harpoon, Polar Beverages and Narragansett will be on hand with craft brew tastings and Ninety Plus Cellars will be donating wine. Hoedown VII will take place September 24, from 4:00pm-9:30 p.m., at Duck Puddle Farm the home of Priscilla and Wil Catlin in Wayland. For Debby Sabin, founder of Lovelane, the Hoedown is a night not only to raise money, but to celebrate the successes of the students that ride at Lovelane. Tickets are on sale now and can be purchased here, Hoedown Ticket. Discounted individual tickets are now available until July 31st for $425, tickets purchased for groups of six or more are available for $375 each, and tickets for young professionals (21-35 years of age) are available for $200 each. ξερωσφύρι (kserosfiri or xerosfyri). A Greek term that literally means "dry hammer" and refers to "drinking alcohol without eating." It is commonly used as a negative reference, as Greeks, like many Europeans, believe you should drink wine accompanied by food. Americans, on the other hand, often drink wine on its own. Maybe more Americans should be emulating the Greeks. At the very least, more Americans should be consuming Greek wine. Why should they do so? Check out my Ten Reasons To Drink Greek Wine, which hopefully will motivate you to sample Greek wines, to explore its diversity and wonders. And let me provide you a specific example as well. This summer, many Americans will drink Rosé, commonly on its own, while they sit outside and enjoy the beautiful weather. However, the Greeks understand that Rosé is an excellent wine for food, pairing well with many different dishes. And in addition, Rosé can and should be enjoyed year round, paired with everything from your Thanksgiving turkey to a simple pizza. In Greece, there is a single Appellation of Origin for Rosé wine, the Amyndeon, located in northern Greece in Macedonia. All of the wines from Amyndeon must contain at least 85% Xinomavro. One of the most well known wineries in this region is Kir-Yianni, which means "Sir John" in Greek. The winery was founded in 1997 by Yiannis Boutaris, who had left the Boutari Wine Group. Though their first vintage was in 1990, it was not until the 1995 vintage that the wine was bottled under the Kir-Yianni name. More than half of their labels are single vineyard growths on the eastern and western slopes of Mt. Vermio in Macedonia. They grow indigenous Greek grapes as well as some international ones such as Syrah and Sauvignon Blanc. I recently received a media sample of the 2015 Kir Yianni Akakies Rosé ($15), which is made from 100% Xinomavro. The vineyard for these grapes is located at an altitude of about 2300 feet and is surrounded by numerous Acacia trees. The term "Akakies" means "Acacia" and refers to the presence of these trees. Xinomavro (which means "acid black") is an indigenous grape in northern Greece and often is compared to Nebbiolo. Xinomavro is difficult to grow and usually provides mild color, strong tannins and high acidity. Because of those characteristics, it ages very well. While young, the wines tend to be dominated by red fruits and as they age, you'll find more savory notes, such as tomato and olive. It is a grape with which you should be familiar, and which should impress. The 2015 Kir Yianni Akakies Rosé under went about 3 months sur lie and batonnage, and has a 12% ABV. With a bright pink color, I found this Rosé to be crisp, dry, and full bodied with bright strawberry flavors as well as some savory, herbal notes, especially on the finish. It was clean and refreshing, an excellent summer wine, yet which would not be out of place during the winter either. It would pair this with seafood dishes, from oysters to sushi, as well as roast chicken and even pizza. I even paired this Rosé with ribs and it would very well. I don't believe it's a coincidence that some of our favorite foods, from pizza to burgers, tacos to cupcakes, are held in our hands as we eat them. Generally, we pick up these foods with our hands and bite into them, which creates a greater connection between us and our food. Usually, there isn't an intermediary of metal, wood or plastic utensils which might interfere with our enjoyment of these foods. It's a psychological issue, and one which most people don't even think about except on an unconscious level. They understand they enjoy these foods and can describe in the detail many of the reasons for such, except they will rarely mention that part of the reason is that they can touch the food. Eating with your hands can even lead to you licking your fingers, savoring the sauce, condiments, cheese, frosting, and other items that might accumulate on your skin. There is a certain intimacy involved in eating food with your hands, one which we appreciate though usually on a deeper level. Yes, you can enjoy food which you eat with a knife and fork, but there is something more satisfyingly primal with being able to use your hands. What may make us think more closely about this issue is when we are confronted with a situation outside of the norm, when we are unable to eat a certain item with our hands that usually we should be able to do so. For example, this weekend I ate at a local Mexican restaurant, opting for some steak tacos in corn tortillas. Tacos should be finger food, whether a hard or soft taco. You shouldn't need to use a fork and knife to eat a taco, and if you do, there is a large disconnect, and ultimately the food won't seem as tasty. The tortillas for these steak tacos were a fail in this regard. They had been cooked so much that they were limp, with a greasy texture, and made it near impossible to pick up and eat. I had to use a knife and fork to eat them and overall, it was unsatisfying. It was difficult to get the right ratio of ingredients on the fork, definitely very different from being able to hold the taco in your hand and bite into it. The same would apply to a burger that is so filled with extra ingredients that you can't pick it up but rather need a knife and fork. You lose part of the essential aspect of the dish, the direct connection of flesh to food. I'm not sure all restaurants understand how certain foods should not require utensils to enjoy, that part of the allure is being able to hold them in your hands as you eat them. Do your own test at home. Try eating some of the foods with your hands and try some with utensils. And I bet, if you're being honest, you will notice a difference. Let me touch my food! 1) Celebrate Banyan Bar & Refuge's "1st birthday" with a Hawaiian Style Luau on Monday, July 25th. Lei's, Tiki drinks (out of pineapples), an a la carte menu filled with Kulua pork, Poke , and so much Don Ho music. This is a seated dinner. Banyan opens at 5pm but will be taking reservations depending on availability and until the kitchen closes at 10pm. Reservations can be made by calling the restaurant 617-556-4211. 2) Pier 6, Charlestown’s waterfront dining destination, has just launched its mid-summer menus featuring fresh, seasonal ingredients from Executive Chef Adriano Silva. New dinner additions include the Halibut Tartare with avocado, wontons, and sesame vinaigrette ($15), Local Burrata with a tomato chutney, arugula pesto, and brioche ($12), Provencal Style Duck Leg served with brussel sprouts, celery root puree, and a plum coulis ($14), Pepper Crusted Tuna with summer vegetables and a gazpacho sauce ($27), and a New York Strip with cauliflower mashed potatoes and a mushroom gravy ($35). For an afternoon delight try the all new lunch menu which includes Grilled Swordfish with sugar snap peas, faro salad, and romesco ($25), or a Chicken Caesar Wrap with parmesan, croutons, and potato salad ($12). Brunch offers options such as Avocado Toast with cherry tomato, dukkah, feta, and fried egg ($8), or the Heirloom Tomato & Watermelon Salad with fresh mozzarella, red onion, and balsamic ($10). For an al fresco dining experience order off the new deck menu with options such as the White Clam Flatbread with corn, bacon, tomatoes, mozzarella, and cherry peppers ($14), or a Rustic Italian Flatbread with sopressata, oregano, mozzarella, and cherry peppers ($12). If you live in Massachusetts and love beer, then you've likely heard of Night Shift Brewing, a craft brewery located in Everett. Even though their beer generally isn't sold outside of Massachusetts, numerous beer lovers from other states are also aware of and enjoy their beer. At the Beacon Hill Wine & Gourmet in Melrose, where I work part-time, I see the popularity of Night Shift beer as it doesn't stay long on the shelf. Though I'm not really a beer lover, I took the opportunity last week to attend, as a media guest, a tour and tasting at the brewery. I wasn't hopeful that I'd find a beer I enjoyed, but I was willing to check it out anyway and see what I might find. To my pleasant surprise, I found two beers that I actually liked, one which impressed me so much that I bought a couple bottles to take home. The origins of Night Shift Brewing extend back to 2007, when three friends, Michael Oxton, Michael O'Mara, and Rob Burns, engaged in home brewing in a kitchen in Somerville. Their passion for home brewing grew, and they referred to themselves as "Night Shift" as that is when they did most of their brewing as they all worked day jobs. Eventually, in 2011, they started construction of their first commercial brewery on Charlton Street in Everett and it opened in March 2012. They quickly outgrew this spot and in May 2014, they opened a new brewery on Santilli Highway in Everett. Current plans include the production of 10,000 barrels of beer this year. The new brewery space includes a 2500 sq. ft. Taproom, which originally was somewhat of an after thought, as the founders didn't expect it to be as popular as it has become. You can order any of their beers, in a variety of sized-glasses, many on draft. You can also order a sampler so you can try multiple beers. They sell a little bit of food as well. Currently, they sell about 50% of their production in their taproom, showing its importance and popularity. In addition, most of the rest of their production is sold within 25 miles of the brewery. It also helps that the brewery hosts a number of different activities during the week to draw in more customers. They also have a patio area where you can sit and drink this summer. It's a commercial area of Everett so the view isn't anything special, but you are there for the beer, not the view. Night Shift seems to experiment often, trying to create a wide variety of different beers, including the use of a myriad of barrel types, mostly used, for aging. There are seasonal beers as well as beers that are available year round. My primary reason for disliking most beer is their bitterness due to the hops. I have a sensitivity to certain types of bitterness and hoppy beers are a major turn-off to me. However, I am aware that there are some types of beer where the hop influence is minimal, such as the Gose style. Gose (pronounced like "Gozer" the evil, god-like entity from the original Ghostbusters movie) is a style of beer that extends back at least to the 16th century, though some claim its lineage is even older, where it is invented in the German city of Goslar, from which it acquired its name. Over time, the style became extremely popular in the city of Leipzig, leading to the construction of over 80 Gosenschänken, Gose taverns. The style died off after World War II but has been seeing a resurgence in recent years, including the production of numerous Gose beers in the U.S.
Usually, Gose is a top-fermented sour beer, brewed from at least 50% malted wheat, with the addition of some coriander, and usually has only a 4%-5% ABV. They generally do not have a prominent hops flavor and taste sour because of their inoculation with lactic acid after the boil. Gose commonly has a tart lemony taste with an herbal element and briny aspect. The briny aspect sometimes comes from the addition of salted water. Within the U.S., breweries across the country have been creating their own Gose-style beers, putting their own spin on it, including some which are hoppy or flavored with other substances. The Night Shift Harborside ($12/750ml) is a Gose-style ale that was brewed with coriander and Island Creek Oysters. Beer brewed with oysters? Yes, and they are not the only brewery which has done so. The Harbourside is a traditional Gose in many ways, being a top-fermented wheat beer and a 3.6% ABV. However, instead of adding sea salt or salted water, they produced the batch with the addition of about 350 live oysters to the wort a few minutes before the end of the boil. I found this beer to be crisp and refreshing with a bright lemon taste, mild coriander spice, and a strong briny element which I very much enjoyed. It made for an excellent summer drink, sour and salty, and lacked the bitterness I find in many there beers. And with its low alcohol, you could drink plenty of this on a nice summer afternoon. I think this beer would pair well with seafood dishes too! It certainly qualifies as the best beer I've had this year and sets a high bar for any other beers I sample the rest of this year. Even if you think you don't like beer, you should taste the Harborside as it may change your mind. I also enjoyed the Timbo Slice, a barrel-aged sour golden ale with tangerines and apricots. It had bright fruit flavors, including stone fruit and tropical fruit, with a mild earthy aspect. This is a beer with a bit more substance to it, and just wasn't as summery as the Harborside, though I would enjoy the Timbo Slice in the fall and winter, maybe paired with a beef dish. Rant: Why Aren't You Drinking More Rum? Why aren't you drinking more Rum? As I said recently, "Rum may be one of the most under appreciated spirits, something which is most likely to end up in a cocktail rather than sipped on its own. It isn't as revered as Whiskey or as popular as Vodka. You'll usually find plenty of Tequila bars but few Rum bars." Last year, according to the Impact Databank, the overall category of Rum declined by almost 2%. Why is that the case? Why are less people drinking rum? And how do we turn around that decline? There is a little bit of good news though, despite the general decline, as the the top five most popular Rum brands, above $15, actually increased by about 3% last year. This is a small increase but still important as it is at least a positive change. There is still much more growth which is warranted and desired, so let us hope that the changes continue and grow. The top five Rum brands include Pernod Ricard’s Malibu, Proximo’s The Kraken, Campari America’s Appleton Estate, Diageo North America Myer's, and William Grant & Sons Sailor Jerry. Even their growth has been a bit rocky during the last few years. For example, from 2013-2014, both Malibu and Myer's saw declines of about 2%. And from 2014-2015, Sailor Jerry saw a decline of about 4.6%. The Kraken has seen some of the best growth, 18.5% from 2013-2014 and 12.5% from 2014-2015. Even though these are the five most popular brands, their total production generally isn't that high, such as 110,000 cases from Sailor Jerry and 360,000 from the Kraken. Summer is supposed to be a very popular time for rum, especially in frozen concoctions, but rum can and should be enjoyed year round. There is a great diversity of rum styles and types, including British, Spanish and French. There are complex and intriguing high end bottlings which can be as interesting as whiskey, though rum often costs less than comparable quality whiskey. Rum can be delicious on its own though it also is extremely versatile in cocktails. It would seem to be an excellent spirit which should warrant much more attention yet it hasn't really done so yet. And that is puzzling. Recently, I've written a few articles about Rum, showcasing its potential and providing some recommendations, including: Diplomatico Rum: Venezuela, Water Buffalo & Tasty Rum; Thirst Boston: History of Caribbean Rums; and Thirst Boston: The House of Agricole Rhum. You can find a number of other Rum posts on my blog as well. It is a spirit I enjoy, one which I encourage all of my readers to explore and embrace. We also need more restaurants and bars to start showcasing Rum, to offer a greater variety of brands, styles and types. We need them to create and offer more interesting Rum cocktails. So I return to my original question: Why aren't you drinking more Rum? What's your excuse? Why are you drinking other spirits rather than rum? What is it about rum that turns you off? Do you see it as a lesser spirit? If so, why? And if you actually enjoy rum, give us some reasons for your love of this spirit. Share your thoughts and maybe others will reconsider their position and start drinking more Rum. 1) In celebration of summer in the city, Lydia Shire – alongside executive chef Simon Restrepo and executive sous chef Alex Pineda – is bringing seasonal specialties to the menu at Scampo with nearly 30 new offerings. To whet your appetite, there are a series of newcomers. For a decidedly summer starter, the Lemon Cukes & Avocado are served over a cilantro and peanut salad with a toasted sweet sesame dressing ($13). For sea treasures, Scampo is bringing back their signature Clams Casino ($16) in addition to debuting Sushi Tuna that has been crisped in bean thread noodles and served with kabocha squash dumplings ($21) and Purple Garlic Soup with homemade almond milk and buttered crab ($16). For meat lovers, new options include the Tender Broccoli Raab with farro strozzapreti and caramelized pork belly ($21), a sharable platter of Greek Style Lamb Chops with tomatoes over a whipped garlic and vinegar skordalia ($32) and Hungarian Mangalica Prosciutto with dark maraschino cherries and a stuffed zucchini flower ($36). From the signature mozzarella bar, there are a trio of newcomers, one served with vine ripe heirloom tomatoes and basil ($14), one with beef sirloin carpaccio, arugula, beet root hummus and fried chick peas ($23) and another with burrata, corn shoots and sweet vidalias on a warm puffed caramelized red onion tart ($21). In the “Handmade Breads” category, there is Garlic Bruschetta with baccalà mantecato ($10) and on the pizza side, there is a White Pizza with truffle cheese, sherried chanterelles and fig preserve ($28) as well as Melting Stracchino with crushed potato and crumbled hot sausage ($20). The “Handmade Pasta e Risotti” offerings have been refreshed to include Corn & Mascarpone Ravioli with sherried chanterelles and toasted hazelnuts ($19/29), Spinach Gnocchi with delicate poached shrimp “meatballs” and an ‘assertive’ green herb sauce ($18/28), Spiced Lamb Manti with saffron yogurt and a brown butter tomato sauce ($19/29) and Walnut Risotto with robiola and brûléed fresh figs on a grilled, toasted fig leaf ($28). The entrée-sized “Plates” also have undergone a seasonal revamping, including the Yellow Miso Glazed Chilean Sea Bass with lemony cous cous in tagine with ras el hanout ($38); Grilled Scottish Salmon with blistered kale leaves, beet red wine butter and white truffled potato gnocchi ($34); Pink Swordfish ‘Piccata’ with sliced green heirloom tomatoes, Sicilian pistachio pesto and crisped Florida rock shrimp ($36); Brick Chicken with coconut onion rings ($30); Charcoaled Duck Breast with broiled fresh plums on a toasted olive oil cake, finished with red sorrel leaves and candied fennel ($34); Sugar Cane Roasted Kurobuta Pork Chop with summer’s fresh corn risotto and shaved black truffle ($39); Charcoaled Porcini Rubbed Veal Chop with charcoaled sugar snap peas, buttermilk aioli and aligot potatoes ($46); and a 1.75lb Lobster Savannah ($48), a resurrection of Shire’s famed dish at Locke-Ober. 2) On Thursday, July 21, from 6:30pm-9:30pm, Bar Boulud, Boston, located at Mandarin Oriental, Boston, will embark on a vinicultural journey to Provence. Provence, located on the southern coastline of France, has long been regarded as one of the world’s best winemaking regions and it happens to be one of Chef Daniel Boulud’s personal favorites. Guests are invited to join Bar Boulud's Sommelier, David Bérubé, for this four-course educational experience, which will feature bold and classically complex wines paired with seasonal French-inspired classics. 3) Sister restaurants Parsnip and Night Market of Harvard Square, are pleased to reunite Chez Henri alum Jason Tom, Mark Thompson, John Hendron, Rembs Layman and and former Chef/Owner Paul O’Connell, for a very special pop-up dinner. that pay homage to a much missed and beloved institution. On Thursday, July 28, there will be two seatings, a 5:30pm/6pm and 7:30pm/8pm for this dinner which will bring back Chez classics such as empanadas, guava-glazed ribs, and of course the (infamous) Cuban sandwich. A mélange of Cuban-inspired cocktails will be available for purchase. 25% of the proceeds will benefit Chef Paul O’Connell’s new organization, NECAT. NECAT's Culinary Arts Job Training Program provides opportunity to resource-poor, chronically unemployed and underemployed adults and at-risk young adults. Through in-demand job training, support and employment services, NECAT helps individuals launch careers in the food services industry and achieve economic self-sufficiency. Tickets cost $48, not including drinks and gratuity. Tickets can be purchased at: http://www.eventbrite.com/e/chez-henri-reunion-at-parsnip-restaurant-tickets-26563326625. 4) French culinarians extraordinaire Jacky Robert and Sam Sosnitsky invite you to join them in the celebration of Ma Maison’s one year anniversary. Their cozy Beacon Hill restaurant transports you directly to a boutique Parisian cafe, where diners can enjoy authentic cuisine Francaise. Period. In recognition of thus milestone, Chef Jacky has created a special $45 dollar, pre-fixe menu to mark the event. The special anniversary menu of will be available starting the night apres Bastille Day on July 15th and continue through September 1. Reservations are highly recommended and can be made by calling 617- 725-8855. 5) Chef Dan Bazzinotti and the BISq team are excited to announce a new summer menu that presents some of the summer’s best ingredients in innovative ways. While delivering fresh summer flavor, BISq’s new menu remains focused upon the rustic yet refined food with emphasis on eclectic, shareable small plates that the Inman Square eatery has become known for. The Smoked Cornbread Blood Sausage really intrigues me! Probably going to check it out. "Few drinks are as widely consumed and misunderstood as baijiu." In my prior Baijiu posts, I've only scratched the surface of the wonders and complexities of this Chinese spirit. Though I intend to explore it more in future posts, there are some other resources you can seek out to learn more about Baijiu. You'll find a number of online and printed articles about Baijiu, though most don't go into great depth. However, there is also a single English book about Baijiu which provides much more depth and plenty of details about this intriguing Chinese spirit. You should check out, Baijiu: The Essential Guide To Chinese Spirits by Derek Sandhaus (Penguin Books, Australia, November 2015 in paperback-$16.95, March 2014 in e-book-$9.99). The book has approximately 194 pages and is broken down into about 12 chapters. Sandhaus has spent many years in China as a China-based writer and editor and has previously published two books, Tales of Old Peking and Tales of Old Hong Kong. He also maintains a blog, 300 Shots at Greatness and runs a Baijiu consultancy. Sandhaus has this to say about his book: "This book is intended as a step towards bridging this knowledge gap, but moreover it is a celebration of China's marvelous traditional spirits." He continues in a little more depth: "Within its pages is all the information one would require to understand to differentiate types of baijiu—tastes, categories, production methods, regional characteristics, etc—and an in-depth overview of major brands and distilleries. Make no mistake, this is the blueprint for putting together a bitchin’ Chinese liquor cabinet and annoying your friends with pointless baijiu trivia." The book begins with a history lesson, extending back to ancient China and the invention of alcohol. Interestingly, the Chinese viewed alcohol as a luxury, not a necessity like Europeans who drank alcohol because their water was unsanitary. The Chinese though drank boiled water and tea, avoiding the need for alcohol like Europeans. The history lesson then deals specifically with Baijiu, from its beginnings to the present. Sandhaus paints a fascinating picture of this history. Next, Sandhaus delves into the production process of Baijiu, from its ingredients to qu, fermentation to distillation. Though these topics could be complex, Sandhaus provides an easily understandable view into the entire production process. If you are familiar with the usual processes of fermentation and distillation, you'll be intrigued by the unique aspects of making Baijiu, from its solid state fermentation to the use of mud pits. The book then moves onto an explanation of the four mains styles of Baijiu, identified by their aroma, and then also explains numerous other smaller styles, from Dong Aroma (medicine aroma) to Chi Aroma (which is infused with pork fat). You learn how these different styles are produced differently, helping to show the vast diversity of Baijiu. Continuing on, you'll find information on drinking etiquette in China, from toasting to gift giving. "There's an old saying in Chinese winemaking: 'Water is an alcohol's lifeblood, qu is an alcohol's backbone, and grains are an alcohol's flesh." The next section is the longest, a list of some Baijiu brands with tasting notes and information on the distilleries. With over 10,000 distilleries, this certainly isn't a complete list but includes many of the most popular brands, and a nice cross-section of different Baijiu types. This is an excellent reference if you want to learn more about a specific Baijiu brand, and also provides the URLs to the distillery website. You'll find some fascinating historical facts within this section too as well as photos of each Baijiu bottle. Sandhaus even provides a shorter section on Huangjiu, basically "yellow wine," which includes traditional Chinese grain wines and beers. This is even more difficult to find locally than Baijiu but is another interesting section to read, with lots of intriguing history and trivia. After that section, you'll find a brief section on Cocktails, including four recipes for drinks including: El Presidente, The Yellow Emperor, Chinese Zombie, and Fire & Ice. At the end, there is also a Glossary of terms, useful for reference. Throughout the book are plenty of color photos, including bottle shots of each Baijiu, and they will enhance your appreciation of Baijiu. It may be the only Baijiu book in English, but it would still be a valuable reference even if there were others. Sandhaus has written a detailed, but easily understandable, book about Baijiu which should help motivate readers to give this intriguing Chinese spirit a try. It might have been nice to see more cocktail recipes and some information on food pairing, but those are minor issues which don't detract from the usefulness of this book. Baijiu: The Essential Guide earns my hearty recommendation. Portland, Oregon is well known for its abundant wineries, craft distilleries and breweries. It is also a Sake lover's destination, with plenty of Sake bars and a Sake brewery located nearby. In addition, you can find a hugely popular Asian spirit being distilled in Portland, the first and only distillery of its kind in the U.S. The Vinn Distillery, located in Wilsonville, Oregon, just about 18 miles south of Portland, produces Baijiu, a Chinese spirit. The distillery is owned and operated by the Ly family, whose roots stand firmly in China and have been producing Baijiu for over seven generations. The original Ly ancestors were originally from the city of Heyuan of Guangdong Province, which is located in southern China on the coast of the South China Sea. Guangdong is well known for its production of Rice Baijiu, and that Baijiu once was called samshu, which means "triple distilled." This province is also well known for infusing wine and Baijiu with pork. About four generations ago, the Ly family, seeking a better life, moved to Quang Ninh Province in North Vietnam, just south of the border of the Guangxi Province of China. In 1978, the Ly family was deported from Vietnam and returned to southern China, where they lived for six months before escaping to Hong Kong. They spent another six months as refugees in Hong Kong until they were sponsored by the Meridian United Church of Christ (also known as Frog Pond Church) in Wilsonville, Oregon, and came to the U.S. in 1979. 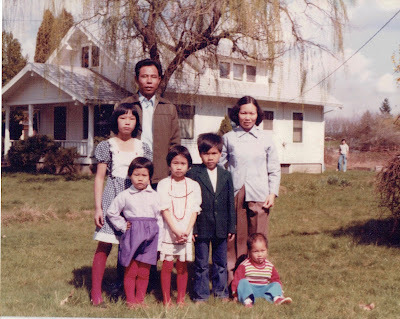 Above is a photo of the Ly family upon their arrival in Oregon. Baijiu was very important to the Ly ancestors, and that importance has carried through to the present day. Baijiu is used to honor their ancestors, to accompany celebrations, for medicinal purposes, and for personal consumption. As they lived in tiny villages in both China and Vietnam, there weren't any local liquor shops where they could purchase Baijiu so they either needed to make their own or buy it from one of their neighbors. Many of the villagers chose to create their own and that is how the Ly family got started over seven generations ago. Some of their neighboring villagers even bought Baiju from the Ly family. In Oregon, the family patriarch, Phan Ly, eventually retired and decided to fill some of his free time with creating spirits made from rice, including Baijiu. Baijiu wasn't readily available at Portland liquor stores so he saw a need to be filled. In 2009, the Vinn Distillery was established though originally Phan wanted to call "Five Siblings," after his five children. Instead, they chose Vinn, which is the middle name shared by all five children, and that name reflects Phan's original intention to honor his children. In addition, "Vinn" roughly translates as "infinite," which they state refers to "the amount of pleasure and taste derived from a single sip" of their Baijiu. In return, the children working at the distillery honor their father by continuing his work producing Baijiu. A photo of Phan Ly and his wife, Kim Trinh, standing amidst numerous brewer buckets of Baijiu. The entire family now works for the distillery in one role or another, though some of the members have other full-time jobs. Their mother, Kim Trinh, is the Master Distiller and conducts most of the distillation of their Baiju. The oldest sister, Lien Ly, is also a Master Distiller and in charge of Production. The oldest brother, Quyen Ly, is in charge of Operations while the middle sister, Michelle Ly, is in charge of Sales & Marketing. The youngest sister, Vicki Ly, is in charge of Accounting & Events while the youngest brother, Quan Ly, who lives in Toronto, helps out when he is in town. It is truly a family affair. A photo of the distillery, essentially a large pole barn behind their mother's home. Their Baijiu recipe has changed little since it was previously produced in Vietnam. One of the main differences was that it used to be fermented and aged in ceramic pots. Currently, their Baijiu is made from 100% whole grain brown rice from California. They make their own qu, over the summers, using rice flour and proprietary herbs & spices. Fermentation occurs in small 7-gallon brewer buckets as they have found that the smaller surface area of the those buckets allows the qu to work more effectively. Distillation occurs in a 40-gallon pot still, which was created by their father who hired a welder friend to help fabricate the still and one other. After three distillations, the Baijiu is then aged in a stainless steel tank for about a year. They still have some bottles of Baijiu that were bottled back in 2009 by their father. They do not filter the Baijiu so it will retain its earthy aroma and flavors. It is bottled at 40% ABV, lower than usual, to make it more amenable to Americans. Each year, they produce about 500 gallons of Baijiu though that should increase now as they have started to distribute outside of Oregon. Their biggest challenge is educating Americans about Baijiu, most who know little, if anything, about this Chinese spirit. During the last four years, their local population has gotten better, more willing to try their Baijiu, but much more marketing is still necessary for the average consumer to embrace Baijiu. Though the Ly family prefer to drink their Baijiu on its own, they understand that many Americans prefer cocktails so they have a page of Cocktail Recipes for their Baijiu, from a Bloody Mary to a Vinn Dragon. As for food pairings, Michelle Ly told me that the best food for Baijiu is Asian cuisine and that her father's favorite dish to pair it with was Steamed Chicken. I should also note that Vinn Distillery produces a few other spirits beside Baijiu, including a Vinn Whiskey, Vinn Vodka, and Vinn Blackberry Liqueur. Both the Whiskey and Vodka are made from rice, and the Liqueur is made with their Vodka infused with Oregon blackberries. I received a media sample of the Vinn Baijiu ($44/750ml). I found it to be a fascinating spirit, reminiscent of Sake yet with its own unique flavors. On the nose, there are elements of steamed rice, some floral aspects and a bit of earthy undertones. The taste follows through on the nose, but with more complexity, including a touch of citrus, more herbal notes and a stronger earthiness. There were also a few nutty notes and a slight heat on the finish. I also used it in a quick cocktail, mixing it with some tropical fruit juice and it did well, muting some of the earthiness and highlighting more of its citrus and herbal flavors. On its own, it's probably not a good introduction to Baijiu for newcomers, especially with its earthy aspect, though those people would likely enjoy it in cocktails. I think the Vinn Baijiu, on its own, works better for those who have enjoyed some other Baijiu and are willing to progress to the next level. In cocktails, it will be versatile and would work well in plenty of different cocktails. On its own, I'd also pair it will more umami-rich foods like a mushroom risotto, though it might go very well with a spicy barbecue sauce too. Have you tasted Vinn Baijiu? If so, what were your thoughts? 1) On Tuesday, July 19, at 6:30pm, Legal Sea Foods in Park Square will host a wine dinner with selections from Kistler Vineyards. Located California and founded in 1978, Kistler Vineyards is a small, family owned and operated winery dedicated to the vinification of world class Chardonnay and Pinot Noir using old world Burgundian techniques applied to new world vineyards. 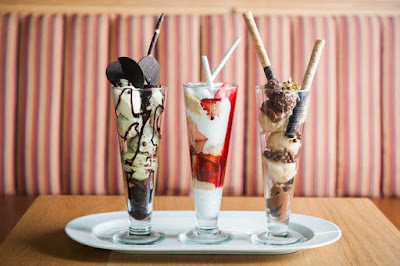 2) At Bar Boulud, Boston, Pastry Chef Robert Differ is celebrating the arrival of National Ice Cream Month and National Ice Cream Day (July 17) by debuting “Back Bay Sundaes.” Chef Differ is serving three ice cream sundaes, a nice summer treat to enjoy on their terrace or in the lounge. Always taking into account the ever-changing seasons of New England, Chef Differ is inspired by desserts that skillfully offer a balance and juxtaposition of texture, temperature and seasonal flavors. You probably know about various barbecue styles, from Carolina to Memphis, Kansas City to Texas. Locally, you might have dined at Redbones BBQ, Sweet Cheeks Q, or Blue Ribbon Bar-B-Q. However, are you familiar with the barbecue style of Chuan'r, and do you know where to find it locally? Chuan'r, Chinese barbecue, originated in the Xinjiang and Inner Mongolia regions of northern China. It essentially consists of small pieces of spiced meat roasted on skewers. Lamb was originally the meat of choice with cumin as the most commonly used spice. Over time, as the popularity of this cuisine spread, it began to include skewers of many different meats, as well as vegetables and even seafood. It is now a common street food and you can see part of its evolution in the common Chinese-American dishes of teriyaki beef and chicken, which are usually served on skewers. I was recently invited as a media guest to check out Wu Er Barbecue, which is located in the Brookline Village area. As you walk inside, there is a large aquarium to your right and then you'll encounter a moderate size bar, with some dining tables to the left. However, the place is a bit deceptive as you can wind your way through the restaurant and find additional booths and tables in other rooms. From the outside, you would probably never suspect that it actually can seat around 70 people, with plenty of room for large groups. It is a casual and comfortable spot (though on my visit the air conditioning wasn't working so it got hot). They have a fully stocked bar, including almost 20 Beers, draft and by the bottle. The Wine list includes about 12 choices by the glass ($9-$13) and most of the bottle choices cost under $55. I was surprised as there are actually some interesting choices on the list and not just the usual suspects. There is a small list of 6 Cocktails ($11), two which are made with Hong Kong Baijiu. They carry 6 different Baijiu, including Hong Kong Baiju, Luzhou Laojiao Zisha, Jian Nan Chun, Shui Jing Fang Wellbay, Wu Liang Ye and Kweichow Moutai. They are available as a Shot, a 2oz Pour, or by the Bottle. Shots range from $4-$16 and 2oz Pours range from $11-$55. I ordered a shot of the Jian Nan Chun, which I hadn't tasted previously. It is produced by a distillery with a history of over 1000 years. This is a Strong Aroma Baijiu, with a 52% ABV, and is made from a blend of sorghum, rice, glutinous rice, wheat and corn. This reminded me in some ways to the HKB, being smooth, light and fruity, with a hint of appealing licorice flavor. There was no burn as I drank it, and the aromas were appealing. A very nice choice. The two cocktails they offer with Baijiu include The New Frontier ($11) and Blue & White Porcelain ($11). The New Frontier is made with HKB, Tequila, Garam Masala, Lime Juice, Bell Pepper & Thai Chili while the Blue & White Porcelain is made with HKB, White Rum, Lime, Coconut Cream, Curacao & Sesame. I tasted The New Frontier and it was absolutely delicious, one of the better cocktails I've enjoyed as of late. The Baijiu took a prominent role and was definitely evident in the drink, which also was only mildly hot but with an intriguing spicy aspect. This cocktail paired very well with the cuisine, including the five-spice & garlic chicken. This is a cocktail that would appeal to many people and would be an excellent gateway to the wonders of Baijiu. I wanted to try the Blue & White Porcelain but they were out of coconut cream. The food Menu has a good variety of dishes, from Skewers to Asian fusion, with plenty of small plates which you can share. You can start with one of their two Soups ($6) or one of the 13 Tapas Style Plates ($5-$12), from Crab Cake to Grilled Chicken Wings. They also have a Raw Bar of Local Oysters and Little Neck Clams, though you can also get Grilled Oysters. They have 3 Skewer dishes ($8-$9), Beef, Chicken and Lamb, which come in an order of 4 with three dipping sauces. You can also order numerous individual Skewers, about 16 options ($1.50-$4), including meat, seafood, vegetables and more. You could choice items like Sausage, Cauliflower, Chicken Gizzard or Tofu. The skewers are cooked over a natural gas grill with volcano rocks to provide a smoky flavor. Their seasoning is cumin based, with the addition of salt, nuts and herbs. For larger dishes, they have three Plates For Two ($30-$48), large trays of Chili Crab, Grilled Whole Fish or Lobster, each with 3 sides. I was told these were very popular and many of their guests order one of these dishes. I saw one of these plates on another table and they the trays are quite large, and look sufficient to feed even more than two people. You'll also find on the menu 6 Entrees ($12-$24), including choices like Zha Jiang Mian, Grilled Lamb Chops, and Teriyaki Steak with Udon. There were also some Daily Specials, adding to the menu. Dinner began with a variety of Skewers, including Sausage, Pork Belly, Chicken, Lamb, Beef, Squid, and Shiitake Mushrooms. The meats were moist, tender and flavorful, with a nice blend of spices. The large piece of squid, pictured on the far right, was also tender and the mushrooms were absolutely delicious. It's easy to understand the appeal of these skewers and based on these alone, Wu Er would be a good destination. I opted for a number of Tapas style plates, to try a few different items, such as the Asian Mushroom Risotto ($10), made with wood ear, shiitake, & cremini mushrooms and topped by a fried egg and scallions. The risotto was creamy, with properly firm rice, and enhanced by the savory umami of the different mushrooms. This would have been a superb dish paired with Japanese Sake, especially a Kimono/Yamahai style. My only suggestion is that the fried egg would have been better served over easy, with a gooey yolk, to elevate the umami level even higher. Highly recommended. I ordered the Yan Su Ji ($6), marinade chicken with five spice & garlic, though I wasn't fully aware what I was ordering as I was unfamiliar with this dish's name. It actually seems to be more popularly referred to as Taiwanese Popcorn Chicken, and that is what came, a large dish of fried chicken nuggets. It is not commonly served with any dipping sauce. The chicken had a crispy coating, with a nice blend of spices, and paired very well with The New Frontier Baijiu cocktail. This is definitely an excellent bar snack, something to chow down while watching a sports game. Another excellent bar snack was the Wu Er Fried Potato Chips ($5), home-sliced potatoes tossed in a cumin seasoning. They were very thin, very crispy and nearly addictive. The Asian Ribs ($11), made with five spice, ginger, hoisin, soy, honey, and scallion, were meaty and tender, with a pleasingly sweet (and messy) sauce. Give me a plate of these ribs and I would be a very happy person. During the dinner, the server brought over these "donuts," basically Bahn Bao, made from rice flour, and topped by a sweet glaze. Though Bahn Bao often have fillings, such as pork and veggies, these didn't, so they were more like a tasty doughnut-hole. They have two Desserts ($6-$8) and I opted for the Crispy Saba Banana Foster, with wonton wrapped banana, rum-caramel sauce & ice cream. A nice blend of textures and flavors, with crisp wonton skins, soft bananas and a sweet & appealing sauce. A decadent ending to dinner. Overall, the food was delicious, reasonably priced, and well spiced. The cocktails are delicious and this is one of the few spots in the local area which is truly passionate about Baijiu. Many of their Tapas style plates are excellent snacks for pairing with cocktails and beer. Service was generally very good, except our serve did forget one of our dishes and had to be reminded about it. I need to get to their Malden location, which has a slightly different menu. I recommend you check out Wu Er in Brookline, and you should try one of their Baijiu cocktails too. "She ate so many clams that her stomach rose and fell with the tide." In New England, Stuffed Clams are a traditional seafood dish, and the basic recipe consists of chopped clams and a breadcrumb mixture. The breadcrumb mixture varies from recipe to recipe, and can include a variety of spices and herbs, as well as maybe some diced veggies and/or chopped meats. In Rhode Island, stuffed clams are commonly known as Stuffies. Stuffed clams were originally created as a way to stretch one's limited food supplies as well as providing some hearty carbohydrates. Now, they are eaten simply because they are delicious. You could take the time and prepare your own stuffed clams at home or pick up some of the pricey, pre-made ones at your local fish market. 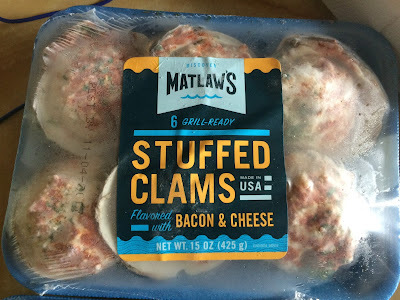 Instead, you could go to your local grocery store and buy some inexpensive, frozen stuffed clams from Matlaw's. 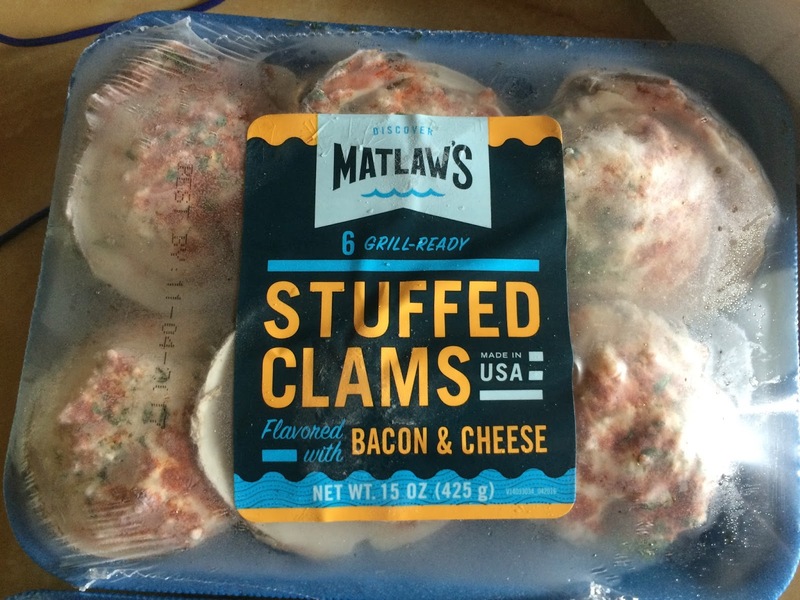 Founded in the 1950s, Matlaw's is the second oldest seafood brand in the U.S. Most of their seafood products are processed at their facility in Gloucester and they also have a large Research & Development laboratory at their Gloucester facility. Besides being a largely local company, they are also dedicated to sustainability, which is very important. Their parent company, National Fish & Seafood, is a founding member of the Global Aquaculture Alliance. When you purchase Matlaw's products, you generally can feel secure that you're purchasing a sustainable seafood product. 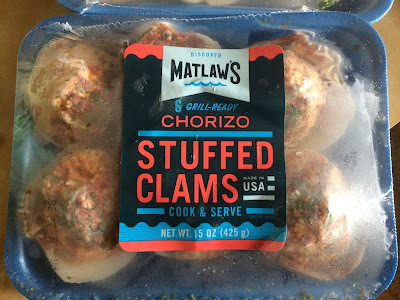 Maltaw's has been making Stuffed Clams for over fifty years, and their product line has expanded to include many other products, such as Seafood Paella, Buffalo Popcorn Shrimp, Salmon Burgers, Panko Breaded Cod, Stuffed Scallops, and more. I've written before, on multiple occasions, about how high-priced seafood prevents many people from eating more seafood, which is one of the healthiest foods you can consume. Fortunately, the vast majority of Matlaw's seafood products cost less than $10, making it very affordable for almost any budget as one package can usually feed multiple people. You can thus receive all the health benefits of seafood consumption, at a very low price. Matlaw's Stuffed Clam line consists of about 8 different varieties, including New England Style Stuffed Clams, Casino Style Stuffed Clams, New England Style Gourmet Stuffed Clams, Natural Style Stuffed Clams, Italian Herb Stuffed Clams, Bacon & Cheese Stuffed Clams, Chorizo Stuffed Clams, and Chili Lime Stuffed Clams. Packages vary from 6 to 12 stuffed claims, with the 6-pack priced at $4.99 so you pay less than $1 per clam.You'll find them in the frozen food section of your local grocery market. At your local fish market, stuffed clams often are priced at $2 to $3 or more each. 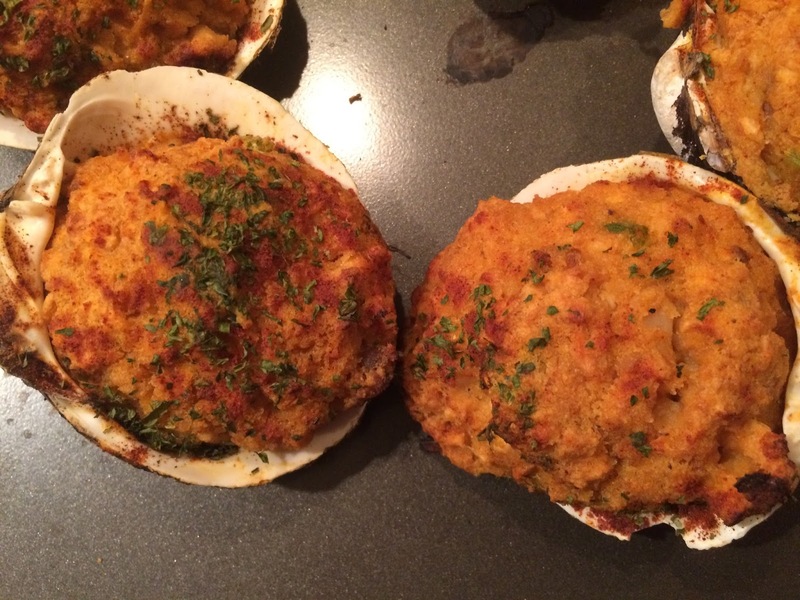 I received media samples of three different stuffed clams and was impressed with their taste and ease of preparation. The Stuffed Clams are very simple to prepare. Just pull them out of the freezer and bake them in the oven at 450 degrees for about 30 minutes. It would be an easy appetizer or a side dish for an entree. Or, you could also make them the center of your dinner. In addition, you can prepare these on the grill. Just preheat your grill to 350-375 degrees and then place the clams directly on the grill. Close the lid and cook them for about 30-35 minutes. An easy summer grilling treat, and a great addition to the usual grilled fare. The basic New England Style Stuffed Clams are made with chopped clams, breadcrumbs, minced celery, red & green peppers, paprika and parsley. The stuffed clam is fairly moist, with plenty of tender clam pieces and a nicely spiced taste. They taste as good as many freshly made stuffed clams that I've had. And all three of the different stuffed clams I tasted were similar in this respect. If you served these to a guest, it's doubtful they would realize these were previously frozen. The Bacon & Cheese Stuffed Clams are made with chopped clams, breadcrumbs, cheese and bacon. These were very cheesy, with a slightly smoky flavor from the bacon, and a milder flavor than the basic version as it appears they have less spices in them. My favorite of the three were the Chorizo Stuffed Clams, made with chopped clams, breadcrumbs, spicy Spanish chorizo pork sausage, minced red & green peppers, and celery. These were boldly flavored, with a slightly spicy kick and the added savoriness of the chorizo. I think these would have been even better on the grill. All of my dining companions enjoyed these stuffed clams the best. At their low price, the Matlaw's Stuffed Clams are a great value. 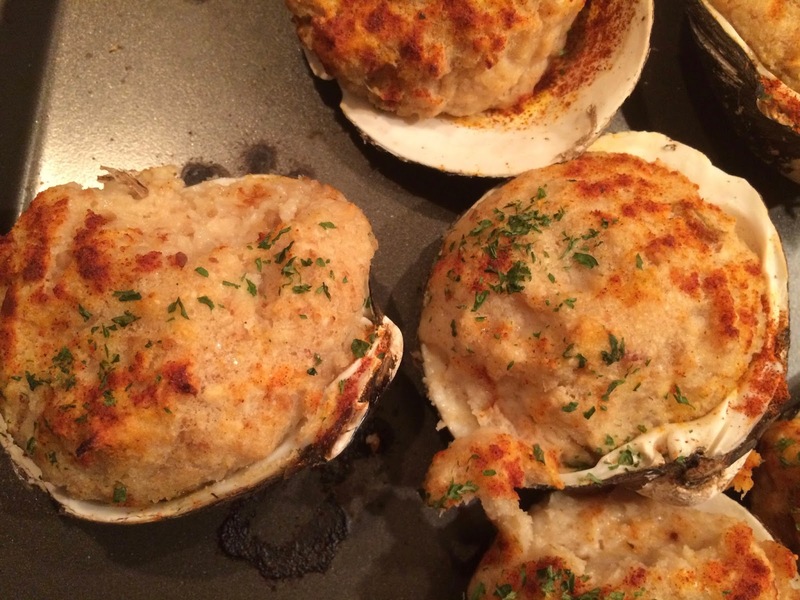 They are simple to prepare and taste delicious, as good as most freshly made stuffed clams. Though you can eat these year round, they will be great this summer, whether in the oven or on the grill. I enjoyed some of these stuffed clams with a nice French Rosé wine and the Chorizo ones would pair well with a light red wine as well. Can you pair food with Baijiu? That is a fascinating question and a potential route to get Americans to taste Baijiu. I've received a couple different opinions on the traditional role of Baijiu and food. The first opinion is that Baijiu is more for a social bond that for any specific pairings with food. In addition, as the usual Chinese meal entails lots of different plates with a wide variety of flavors, textures and types, pairing would be difficult. As such, the food is considered secondary to the Baijiu. The other opinion, offered by Derek Sandhaus, though is that Baijiu is intended to complement the food, and that the food thus takes the primary role over the Baijiu. Though Chinese meals tend to be served family style, with lots of different dishes, each region tends to create an array of dishes that share a cuisine type so they are not as disparate as you might think. The Baijiu produced in each region tends to match the style of that region's cuisine, similar to how wine tends to match the cuisine of the region where it is created. The Baijiu is not intended to pair with any specific dish, as we do with wine pairings, but rather it is intended to pair more generally with a specific regional cuisine. For example, Sichuan cuisine tends to be very spicy and pairs well with the Strong Aroma Baijiu produced in that region. That style of Baijiu tend to be fruity and assertive, helping to cut through the spiciness. On the other hand, Kweichow cuisine, which is more spicy and sour, pairs well with Sauce Aroma Baijiu, which is produced in that region. That style of Baijiu tends to have stronger fermented aromas and more umami, complementing the cuisine. Thus, Derek suggests pairing Baijiu with the regional cuisine of where it is produced. Manny from Private Cask Imports also states that spicy and salty foods from northern and southwest China pair best with Baijiu. What about pairing Baijiu with non-Chinese cuisine? This appears to be an area ripe for experimentation as not as much study has been done yet concerning such pairings. Derek recommends pairing Baijiu with strong flavored foods, such as spicy foods, cause of the Baijiu's strong flavors. For example, he suggested trying Buffalo Wings or barbecue food which has a spicy sauce or rub. Manny also suggests pairing Baijiu with food that tends to be on the heavier side, like meats, noting that Baijiu cuts through fat and heavy sauces really well. I think that some of the newer, lighter style Baijiu that is being produced, such as HKB, can be paired with lighter dishes, from seafood to chicken. The fruity flavors in many of these Baijiu would help to enhance some of the flavors of such dishes. Oysters and HKB? I think that might work and I look forward to trying that pairing. Even something as light as a salad might work with HKB, especially if the salad has some bright citrus elements. I'd encourage you to try a light Baijiu like HKB with a wide range of dishes and find what you think works well. With the stronger flavored Baijiu, you need to work a little harder with food pairings and the advice of Derek and Manny make sense. In addition, I am intrigued about the umami potential of Baijiu as it definitely seems to possess, based on what I've tasted, a strong sense of umami. I've also heard from others who also believe it often has an umami element to its taste. However, this seems to be another issue largely neglected and it is near impossible to find any sources online that discuss the topic. The fermentation process, especially due to its length, of Baijiu is conducive to the creation of a high amount of glutamic acid, which is an important source of umami. In this regard, it is similar to Kimoto/Yamahai Sake, which has high levels of glutamic acid, partially due to its lengthier fermentation period. With its high umami, Baijiu would possess much of the food pairing versatility as Sake. However, based on question I asked of a few chemists/scientists, the act of distillation would seem to omit those glutamic acids from the final spirit. Glutamic acid isn't volatile and seems to have a higher boiling point than alcohol so it wouldn't transfer to the resultant spirit. Could the process of aging though provide umami to the Baijiu? Does sitting in terra-cotta jars for a few years result in changes to the spirit, enhancing its sources of umami? Why do these stronger Baijiu tend to have a powerful umami element? I hope to delve deeper into this subject in the future and if anyone knows more about this issue, please contact me. Hopefully, after my five-part series, you now understand the basics of Baijiu and are encouraged to give it a try. It is a fascinating spirit, with a more unique production process, and worthy of exploration. Start out with the lighter, lower alcohol versions, and maybe try some cocktails, and work your way up to the funkier types. I shall continue my own explorations and will post more about my experiences very soon. For example, later this week I will be writing about an American-made Baijiu, produced in Portland, Oregon. Ganbai! Do you still have any questions about Baijiu? How can we convince more Americans to try Baijiu? One of the best ways to persuade more Americans to try Baijiu might be to ease them into the spirit through cocktails. Consumers have embraced other niche beverages, such as Sherry, Mezcal, and Sake, through cocktails. Bartenders across the country, who have been intrigued by Baijiu, are starting to experiment with Baijiu cocktails so you can find more and more such cocktails on your local bar menus. It is becoming a hot new ingredient, an intriguing new spirit which with bartenders can concoct their own wondrous creations. Using a Baijiu like Hong Kong Baijiu (HKB) in a cocktail is relatively easy due to its lighter flavors and lower alcohol. For example, you can use it as a simple substitute for other white spirits, from vodka to rum, in a classic cocktail. You could create a Baijiu Margarita, a Baijiu Daiquiri, or a Baijiu Bloody Mary. You can also create your own new Baijiu cocktail to highlight the fruity flavors of the HKB. It is more of a challenge to create cocktails using stronger-flavored Baijiu, those with more funkier aromas and tastes. For those stronger Baijiu, you generally need to pair it with equally powerful spirits and liqueurs, from Amaro to Mezcal. Citrus and tropical fruit flavors also seem to pair well with stronger Baijiu. The main idea is to find a way to reduce the earthier, funky flavors while enhancing the other flavors within the Baijiu. However, you will find a small number of consumers who want to embrace the earthiness, who don't want the bartender to hide or lessen those flavors. With such a customer, a bartender can let his imagination run wild. At home, if you are starting out with Baijiu cocktails, I recommend you pick up a bottle of HKB as a start. In the Boston area, if you are willing to explore Baijiu, where can you find it? There are currently about 30-40 Baijiu brands available in the U.S. but you'll only find a small number available for retail in the Boston area. The primary local distributor for Baijiu is Burke Distributing Corp. which has about 7 Baijiu in their portfolio, including Hong Kong Baijiu, Luzhou Laojiao Zisha, Shui Jing Fang, Wu Liang Ye and Kweichow Moutai. Of those five, only the Hong Kong is available as a 750ml, the rest available only in 375ml. As an example, you can find the Kweichow Moutai ($145.99/375ml) and Hong Kong Baijiu ($48.99/750ml) at Redstone Liquors in Stoneham. You should also be able to find Baijiu at stores including Whole Foods Market in the South End, The Wild Duck Wine & Spirits in Chinatown, Burlington Wine & Spirits, Truong Than Market in Chinatown, Morrissey Boulevard Wines and Liquors, Blanchard's Liquors, Liquor World, Wine Gallery, Macy's Wines & Spirits, and Ball Square Wine & Spirits. Any liquor store that deals with Burke Distributing will be able to order Baijiu for you even if your store doesn't usually carry it. You won't find many local restaurants carrying Baijiu though Hong Kong Baijiu (HKB) can be found at a number of places, including potentially Audubon Circle Restaurant, Banyan Bar & Refuge, China Pearl, Fairsted Kitchen, Parsnip, Drink, Wu Er Barbecue, Red Lantern, and Blue Dragon. Though you could order HKB on its own, you are most likely to see it at these places in cocktails. Two spots though, Red Lantern and Wu Er Barbecue, are truly passionate about Baijiu, offering a wider selection. At Red Lantern, they carry Strong Aroma Style Baijiu including Hong Kong Baiju ($10), Luzhou Laojiao Zisha Daqu ($9), Mianzhu Daqu ($9), Shui Jing Fang Wallaby ($20), Wu Liang Ye ($42) and one Sauce Aroma Style, the Kweichow Moutai ($40). These are also available in a Tasting Flight of 3 brands (1/2oz pours) for $33. In addition, Brother Cleve has created a special Baijiu cocktail for them, the Peking Mule ($12), which is made from Mianzhu Daqu, Plum Shrub, Black Walnut & Ginger Beer. At Wu Er Barbecue in Brookline, they carry Hong Kong Baiju, Luzhou Laojiao Zisha, Jian Nan Chun, Shui Jing Fang Wellbay, Wu Liang Ye and Kweichow Moutai. They are available as a Shot, a 2oz Pour, or by the Bottle. Shots range from $4-$16 and 2oz Pours range from $11-$55. 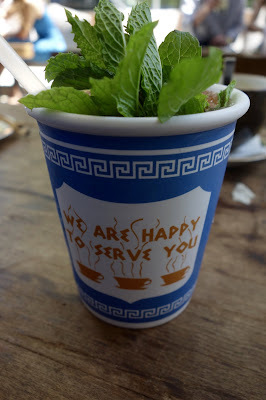 In addition, they offer HKB in two cocktails, The New Frontier ($11) and Blue & White Porcelain ($11). The New Frontier is made with HKB, Tequila, Garam Masala, Lime Juice, Bell Pepper & Thai Chili while the Blue & White Porcelain is made with HKB, White Rum, Lime, Coconut Cream, Curacao & Sesame. I recently had the opportunity to taste The New Frontier cocktail during a media visit to Wu Er Barbecue. It was absolutely delicious and one of the better cocktails I've enjoyed as of late. The Baijiu took a prominent role and was definitely evident in the drink, which also was only mildly hot but with an intriguing spicy aspect. This cocktail paired very well with the cuisine, including the five-spice & garlic chicken. This is a cocktail that would appeal to many people and would be an excellent gateway to the wonders of Baijiu. I wanted to try the Blue & White Porcelain but they were out of coconut cream. Outside Boston, probably the best example of an American bar which is showcasing the versatility of Baijiu is Lumos, the first Baijiu bar in the country, which is located in New York City. With Chinese backers, Orson Salicetti, the former head bartender at Apothéke in Chinatown, has created a temple to Baijiu, a place to find a wide variety of Baijiu, about 40-50 brands. If you peruse the menu, you'll find plenty of intriguing cocktails that sound enticing. They also are making their own Baijiu infusions and aging some Baijiu in oak barrels. Could oak-aged Baijiu taste more like whiskey? You couldn't start a Baiju bar in Boston, especially as only about seven Baijiu are available, and the demographics probably wouldn't support such a niche bar. The next time I visit NYC, I need to check out Lumos. As most of you know, every day is a holiday celebrating some food or drink, from National Doughnut Day to National Margarita Day. Such holidays are best when they try to bring awareness to some niche item, which needs more recognition and promotion. Americans certainly need to know much more about Baijiu so it is cool to know that there is a holiday celebrating this unique Chinese spirit, and it will soon be here. Next month, World Baijiu Day will be held on Tuesday, August 9. This holiday was created by Jim Boyce, who runs the nightlife blog Beijing Boyce and wine blog Grape Wall of China. The intent of the holiday is to raise exposure of Baijiu, to spread awareness beyond the borders of China. There is a list of venues, those bars and restaurants, which are planning Baijiu celebrations and there is a single restaurant in Boston that is currently listed, Red Lantern. Once I learn more about what they plan to do for World Baijiu Day, I will let you know. Happy One Year Anniversary to Committee, an excellent Greek/Mediterranean restaurant located in the Fan Pier neighborhood of Boston. I recently noted that Committee was one of my 5 Hottest Restaurants, and I've recommended it to many people. I enjoy both its cuisine and drinks program, from brunch to dinner, from its Greek wines to creative cocktails. On a recent Sunday afternoon, they celebrated their first anniversary with a barbecue on their patio and I was invited as a media guest to join in the festivities. It turned out to be a perfect summer day, lots of sun and a light breeze that prevented it from becoming too hot. The bar was stocked and ready to serve cocktails while a grill was set up for the food. Chilling on a couch, I sat with some friends and savored the afternoon, finding even more reason to enjoy Committee. A number of appetizers were placed out, including this bowl of Feta and Greek cheese. A trio of dips, including Tzatziki, Carrot Tzatziki, and Avocado Hummus. Their house-made dips are delicious, especially smeared on a piece of warm pita. On the grill, there was delicious Souvlaki, tender chunks of lamb. There were also Burgers, which you could place atop a pita for a delicious sandwich. The Lamb Chops were fantastic, so tender and flavorful. Committee does a superb job with lamb dishes. And there were Veggie Skewers too for those who weren't meat eaters. There were six cocktails available at the party and I sampled all of them, enjoying each one. Overall, they were well composed, nicely balanced, and were excellent choices for the summer. The cocktail program at Committee won't disappoint and you should check it out, especially if you dine outside on the patio some summer afternoon or evening. My favorite of the six cocktails was the We Can't Elope, made with Soul Cachaça, cucumber-cantaloupe syrup, and fresh lime juice. Bright and refreshing, you could taste the Cachaça, which was enhanced by the fruit flavors. I could have easily drank these all day, reveling in the beautiful summer weather. The Frosé, made from Rosé, Elderflower Liqueur, rose water, and citrus, was a frozen drink, a tasty slushie. It wasn't too sweet and had pleasing floral notes which didn't overpower the rest of the cocktail. It was more subtle with some nice red fruit accents. The Jasmine Smash, made with Bulleit Rye, jasmine tea, grapefruit, simple syrup, and mint, is slightly deceptive as it appears to come in an iconic Greek coffee cup yet it is actually a ceramic cup and not paper. I very much enjoyed this cocktail, especially as I love both Rye and tea. The flavors blended well together and it was also refreshing, with spice and floral notes. The Diavolos, made from Tres Agaves Blanco, Lejay Cassis, lime, ginger beer, was another refreshing cocktail with the pleasing taste of tequila and the spice of ginger. In a fun Tiki glass, the Jungle Pilot, made from Plantation Rum blend, Denizen 8, Capari, pineapple-mango juice, and cinnamon, was fruity and fun, a pleasing rum drink. The hint of cinnamon enhanced the tropical fruit flavors and there was also a touch of bitterness which nicely balanced the drink. Finally, the Committee Mule is made with Chili infused Absolut Elyx, cardamon bitters, fresh lime juice, and ginger beer. The spicy kick of this variation on the traditional Mule was a nice change, though it didn't overpower the rest of the flavors. It was still refreshing despite the additional spicy heat. You'll find these cocktails on Committee's current drink menu and I'm sure you'll enjoy them as much as I did. I continue my hearty recommendation for Committee and hope they have many more anniversaries.